Now that car buyers turn to mobile throughout their purchase journeys, Mazda completely redesigned its mobile site to give users an optimized experience. When paired with a dedicated mobile search strategy, the new mobile experience led to a 75% increase in mobile conversion rates. The brands that make up the competitive Canadian automotive industry are constantly working to stay on top of new consumer behaviours. With mobile becoming an increasingly important part of every car buyer's purchase journey (even in early phases like research and awareness), Mazda knew it had to provide a seamless mobile experience to beat competitors to the finish line. Today, over 37% of Mazda-related searches come from mobile phones, and that number tops 50% when tablets are taken into account. Mazda Canada partnered with TeamMazda (consisting of Excelerator Media, a division of Mindshare Canada; Catalyst Canada; and J. Walter Thompson Canada) and Google to better understand how modern consumers go about buying cars and where mobile fits into the process. The teams were able to identify gaps in Mazda's current mobile experience, as well as ways to measure the impact of the mobile platform more accurately. Armed with new consumer insights and data, Mazda set out to build a fully responsive mobile site. To create the best possible mobile site and to better evaluate ROI, Mazda first had to define the core activities of its mobile car-buying experience. These were moments that generated follow-up actions, like users emailing a dealer, locating a dealer, making a phone call to a dealer, using the "Build & Price" shopping tool, or booking a test drive. By prioritizing the moments and conversions that were unique to mobile, Mazda was able to build a user-friendly mobile optimized site. For example, Mazda wanted to encourage more users to visit a Mazda dealer. To do that, potential customers needed to be able to quickly locate a nearby dealer. TeamMazda and Google helped Mazda Canada reach these users by leveraging location extensions, allowing potential buyers to easily get directions or call a dealership nearby. Mazda redesigned its mobile site with easily identifiable features to help facilitate a seamless consumer journey. 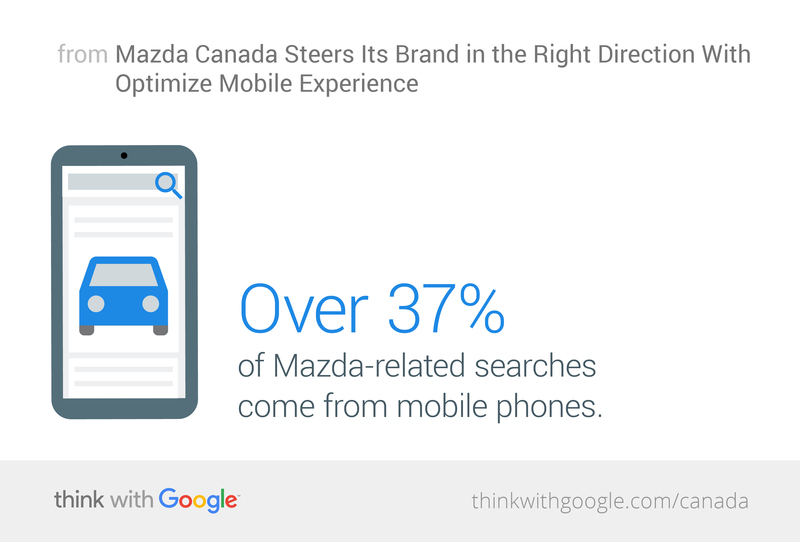 TeamMazda also helped Mazda Canada implement a paid search strategy to drive mobile traffic to the new site. Mazda's transformative bid strategy (an increase of 85% on its base mobile bid) allowed it to reach auto buyers and generate mobile conversions all along the path to purchase. The revamped mobile site and bidding strategy generated a high-volume of phone calls to dealers and more users looking for directions on Google Maps. After the launch, Mazda also saw a massive 75% improvement in mobile conversion rates. The car company experienced a 61% increase in mobile conversions, with an accompanying 20% increase in mobile spend, as well as a 25% lower cost-per-acquisition. "To maximize ROI for Mazda, we optimized our bid, measurement, and creative strategies to reach car buyers at every phase of their purchase journeys." For Mazda, one thing was clear: Car buyers crave seamless, easy-to-use mobile experiences all along their purchase journeys. Caroline Canlas, an Account Supervisor at TeamMazda, said, "To maximize ROI for Mazda, we optimized our bid, measurement, and creative strategies to reach car buyers at every phase of their purchase journeys. We also leveraged all available ad extensions to drive lower funnel activity." Automotive brands that readily meet consumers in these mobile micro-moments are more likely to turn research into test drives and test drives into purchases. "As the automotive purchase journey continues to evolve, brands need to be present and relevant with a customer-centric mobile experience," concluded Michael Tsang, Mazda Canada's Manager of Interactive Marketing.